I made a last minute trip to my LCS last Saturday for the 3 o'clock auction and boy was I glad I did. Even getting there about 10 minutes late I still walked away with 4 items from the auction, for less than $8. 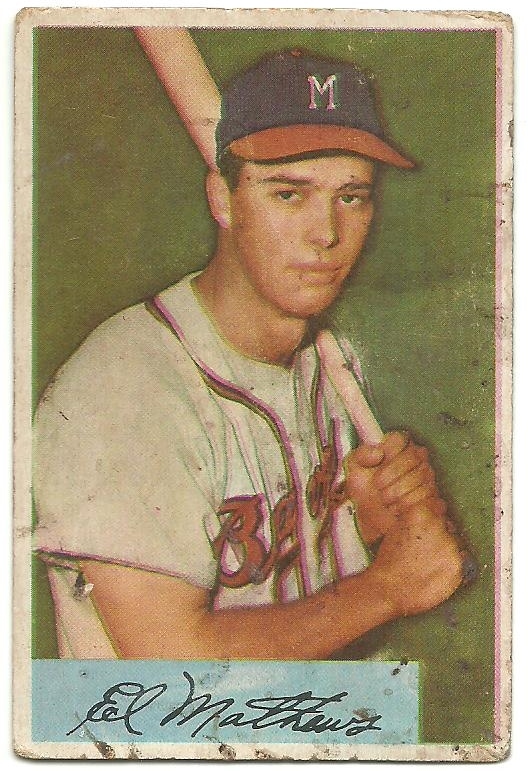 There were only 4 other bidders. usually there are at least 10. This 1954 Bowman Eddie Mathews set me back $3. I know it's in rough shape, really rough shape, but I still love it and for the price, I couldn't say no. Let me know what you think of my $3 purchase. 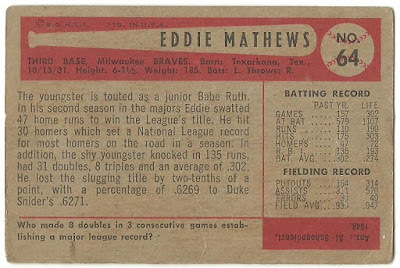 I'm also curious to get your thoughts on Eddie Mathews. I feel like he doesn't get a lot of hobby love. Just curious as to your thoughts why or if you think he gets the hobby love that he deserves.